(PhysOrg.com) -- Graphene is a relatively new material with outstanding electrical, chemical and mechanical properties that make it an attractive material for use as flexible conductors of the sort used in gadgets such as touch screens and flat panel TVs. In the past attempts to make large films of graphene have been unsuccessful, but now a team of scientists from South Korea and Japan have succeeded in roll-to-roll production of graphene films, growing them by chemical vapor deposition onto flexible copper substrates. Graphene is composed of a single layer of carbon atoms in a honeycomb-shaped lattice. It was first isolated in 2004. The material is highly conductive, extremely strong, and is almost transparent, which makes it ideal for high-speed electronic devices. The researchers grew their graphene sheets by chemical vapor deposition onto large sheets of copper foil. They coated the graphene with a thin layer of adhesive polymer and then dissolved away the copper backing. Using rollers, the graphene was then pressed against another substrate, such as PET, and the polymer layer was removed by heating, leaving a film of graphene. 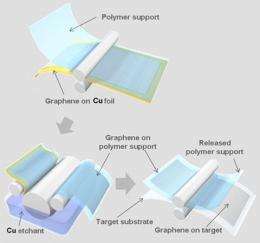 They repeated the process to produce a sheet of four layers of graphene on top of each other. This four-layer sheet was then treated with nitric acid to improve its electrical conductivity. The rectangular sheets, which measured 76 cm on the diagonal, were of extremely high quality, with the four-layer stack of films exhibiting superior electrical resistance to commercially available transparent electrodes such as indium tin oxides (ITO). The films were almost transparent, allowing 90% of light to pass through. The team, led by researchers Byung Hee Hong and Jong-Hyun Ahn of Sungkyunkwan University (SKKU) in Seoul, also incorporated their graphene electrodes into a fully functional touch-screen panel, where they outperformed standard indium tin oxide electrodes, withstanding double the strain that can be handled by the more fragile ITO. According to Ahn, a graphene-based touchscreen should essentially last forever. Electronics companies have been looking for alternatives to ITO for some time because the indium is extremely expensive. Other options looked at have been films of carbon nanotubes, but these have not succeeded because they tend to have small defects that create visible areas of “dead” pixels in displays. Now that graphene has been manufactured in large sheets and demonstrated in real devices, it may only be a couple of years before graphene finds its way into consumer products. Graphene is produced from a small amount of carbon, and unlike ITO production, uses no rare materials. The copper substrate is recyclable, which makes the process more sustainable. The paper is published in the journal Nature Nanotechnology. Laissez faire...you need to have experience with stuff in order to understand it better..
Plus,Electronics nowadays is as eco-unfriendly as any other industry:what doesnt work is thrown away. What if we could make any e-device we wanted just out of carbon,with no toxic elements in it? =) Wouldnt it be nice? I've been hearing about graphene for sometime now and I glad to see it finally has come to be produced at a practical size. This material has a bright future and we will begin to see it many of our day to day activities! Indium is strategic material, whose production is controlled by China. This replacement is of political importance. Of course, indium could be replaced with antimony as well - I'm not sure, whether the lifetime of graphene layers will be comparable. Carbon is much more abundant anyways, and much more scalable in mass production. I can't figure out how we would ever run short on carbon, whereas with ITO and the like, the more you make the more expensive it becomes as the supply is rather limited anyways, regardless of politics. Just think about the thousands of square miles of solar panels that would need ITO to work. Or flatscreen panels - they use ITO anyways, touchscreen or not. With further refinements in the manufacturing process, graphene can pull the costs down by many orders of magnitude and then every window, every roof tile can be a solar panel. Does it matter if it lasts only half the time, when it costs ten times less? Average historical discovery to commercial realization time is usually measured in decades. From initial isolation in 2004, to commercial quality and quantity in 6 years is amazing. I would say 1 decade (2014) for real commercial products, and 1.5 decades until super products (space elevator fabrics, super batteries, etc.) i.e. 2020 or so would be incredible. Exponential technology progress is amazing. It really seems like the technological barriers are being quickly knocked down. It seems like yesterday that the mass production of high quality graphene was impossible. Today they've done it and tomorrow we'll be using it. Simply amazing. Cheap, recyclable, indestructible, a perfect technological advancement. How feasible is it for a hobbyest nowadays to create their own graphene-oled display? Using roll 2 roll or inkjet?